Q. Nestlé's Sustainability Review shows the company's internal auditors standing in front of a shop display for baby food which includes whole milks. Why do the auditors permit this? Nestlé published a Sustainability Review prior to its 2002 shareholder meeting and, in the part relating to infant feeding, claims that the company's internal auditors ensure that breastmilk substitutes are marketed in accordance with company instructions. There is a lot wrong with the company instructions - see our briefing on the Sustainability Review. The Sustainability Review inadvertently reveals another way in which Nestlé endangers infant health. 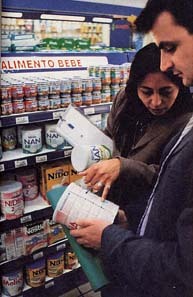 A picture is included showing internal auditors in a shop in Argentina checking the labels of infant formula (shown here). 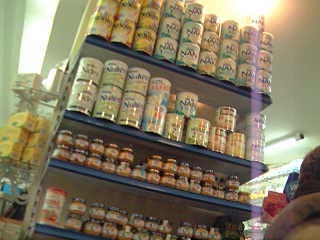 Behind them, amongst the tins of Nan infant formula in a section labelled 'Alimento Bebe' - baby food - are packets of Nido whole milk. Poor mothers who have decided, or been persuaded, not to breastfeed, often use whole milk as it is much cheaper than infant formula. But, as Nestlé is well aware, this product should not be used for infant feeding. Nestlé Chief Executive, Mr. Peter Brabeck-Letmathé, claims to investigate any hint of a violation and to take disciplinary action against anyone who markets breastmilk substitutes inappropriately. Will he put a stop to this dangerous promotion and discipline whoever is behind the Sustainability Review and the auditors who have allowed the promotion to continue? See the Campaign for Ethical Marketing action sheet April-June 2002 for further details and a suggested letter of complaint to be sent to Mr. Brabeck. "Nestlé promotes Nido whole milk widely. In Côte dIvoire and Bolivia, health and community workers encourage mixed feeding as of four months by giving mothers free samples of Nido. Nido is promoted as follow-up formula. There is no age recommendation on Nido." "Nestlé provides shops with discounts, gifts and supplies of more products when the shops make cash purchases, sell greater volumes of their products, launch a new product or provide better shelf space than other products." It is unclear whether Nestlé management are directly encouraging the dangerous and widespread promotion of Nido and Ninho as a baby food. However, it is clear from the Sustainability Review picture that the internal auditors are aware of the practice. Why hasn't it been stopped? Monitoring for Breaking the Rules, Stretching the Rules 2001 was conducted in 14 countries. In this section we will post further examples of inappropriate promotion of Ninho and Nido. You are welcome to report examples to us at Baby Milk Action. If possible include a photograph of the promotion. However, note that shop staff usually object to the taking of photographs on their premises, especially of unethical practices such as this, and are unlikely to give permission. Please provide the date and location of the promotion (we will not publish these details, but may ask the appropriate health inspectorate to visit the shop in question). 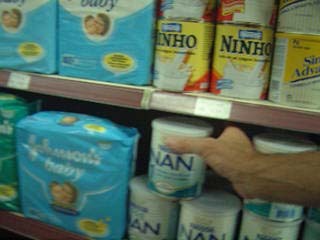 Ninho on the top shelf next to the Nan infant formula in a pharmacy in Teresopolis, July 2002. The Brazilian regulations implementing the International Code and subsequent, relevant World Health Assembly Resolutions require that advertisements for powdered milk include a warning stating that they should not be used for infant feeding. 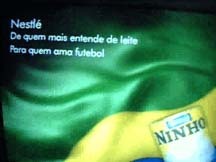 Nestlé advertised Ninho during Brazil's games during the football World Cup without the phrase. 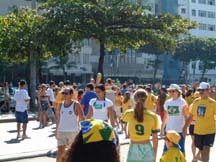 Worse, the voice over for the advertisements stated that Nestlé Ninho had supported Brazil since 'pequininho' - which is the Portuguese word generally used for a young child. Brazilian's celebrating their team's victory on 30th June 2002 at Copacabana beach in Rio de Janeiro. 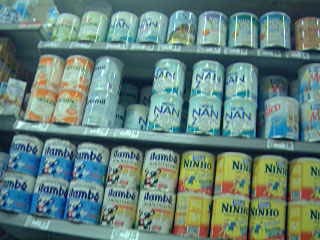 Also in Copacabana Ninho is promoted next to the Nan infant formula in pharmacies - here in a section which was labelled 'mundo infantil' ('Infant World' ). And amongst the infant formula in supermarkets - here the whole milk produced by itambé is also on display. 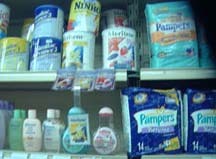 Ninho amongst the baby milk, nappies and baby powder in a pharmacy in the Tijuca region of Rio de Janeiro, July 2002. 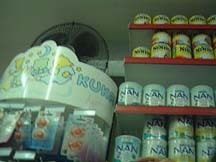 Nestlé Ninho and Nan displayed together in a pharmacy in Petropolis, June 2002. A display of Kuka dummies and feeding bottle teats is alongside (Kuka is a separate company). Special displays such as this are also banned by the Brazilian regulations. Pharmacy, Riberão Preto, Brazil, December 2001 - Nestlé Ninho wholemilk displayed in the baby care section of a pharmacy alongside infant formula. "For me there's only one milk for all my kids. 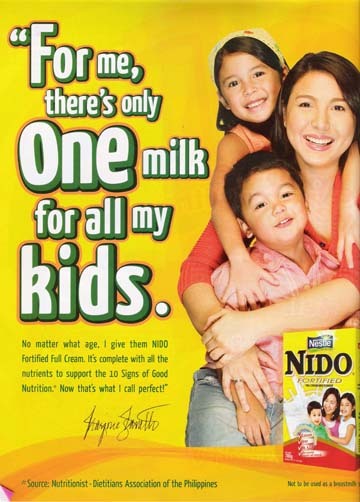 No matter what the age, I give them NIDO fortified full cream milk. 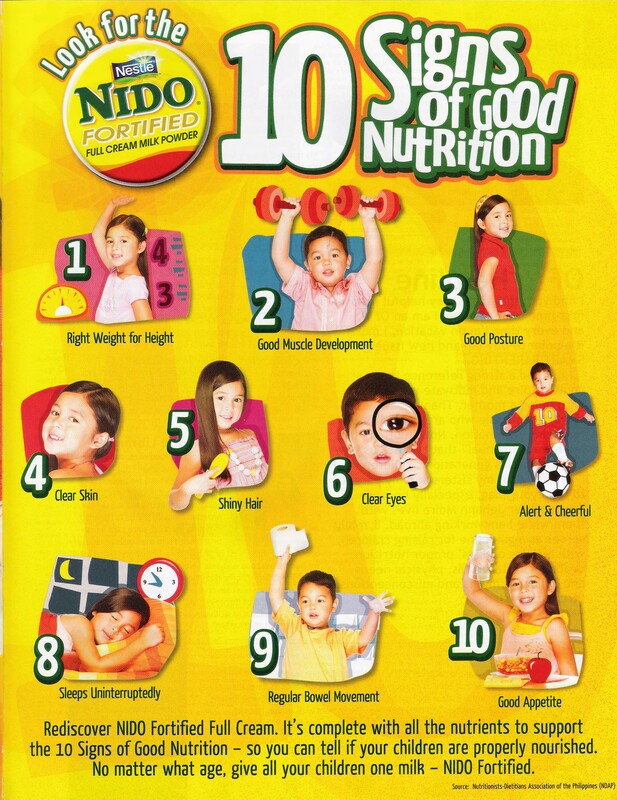 It's complete to support the 10 Signs of Good Nutrition. Now that's what I call perfect!" 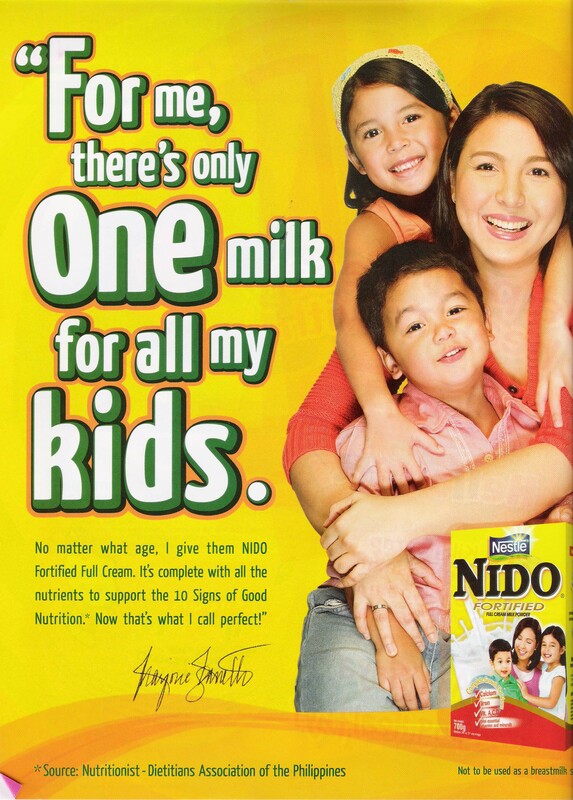 "No matter what age, give all your children one milk - NIDO Fortified."